The Eighteenth Judicial District Commission on Judicial Performance unanimously recommends that Judge Lawrence Bowling BE RETAINED. 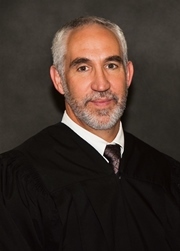 Judge Bowling was appointed to the Douglas County Court in August 2010 by Governor Bill Ritter. Prior to his appointment, he served as a Magistrate in the 18th Judicial District, an Assistant County Attorney in Jefferson County and a Deputy District Attorney in the 18th Judicial District. He received his law degree from the University of Denver in 1993 after earning an undergraduate degree from Colorado Technical College in 1981. Judge Bowling currently presides over a criminal docket. Based on the survey results of both attorneys and non-attorneys, Judge Bowling received an overall combined average rating which was above the average combined rating for all county court judges standing for retention. He received high marks in every category, including application and knowledge of the law, demeanor, fairness and case management. Judge Bowling is described as a thoughtful and capable jurist and a credit to the bench.